Baked Plum Pudding Grate all the crumb from a small loaf of bread (stale), pour over a quart rich milk boiling hot. let it steep for 1 hour. When cool, add to it the following. 1/2 lb currants, picked, washed & dried. 1/2 lb raisins cut & stoned. 1/4 lb citron cut in large slips. 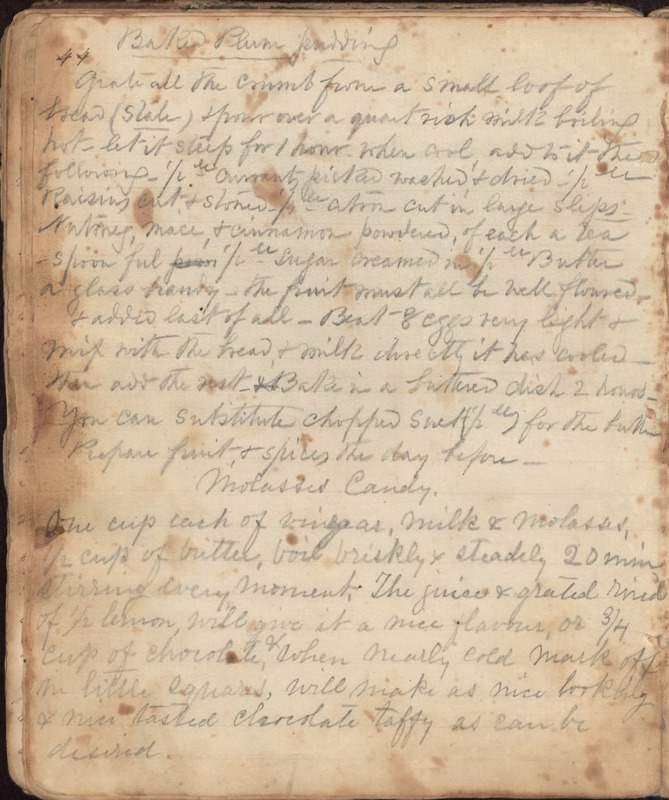 nutmeg, mace, & cinnamon powdered, of each a teaspoonful 1/2 lb sugar creamed in 1/2 lb Butter a glass brandy, the fruit must all be well floured & added last of all. Beat 8 eggs very light & mix with the bread & milk directly it has cooled. Now add the rest. Bake in a buttered dish 2 hours. You can substitute chopped suet 1/2 lb for the butter Prepare fruit & spices the day before. Molasses Candy One cup each of vinegar, milk & molasses, 1/2 cup of butter, boil briskly & steadily 20 min stirring every moment. The juice & grated rind of 1/2 lemon, will give it a nice flavour, or 3/4 cup of chocolate, & When nearly cold mark off in little squares, will make a nice looking & nice tasted chocolate taffy as can be desired.